15 year old Terry Lorenzo Pue (5'5", 105lbs) lived in a housing project at 2548 Hollywood Court NW with his mother, Helen Pue, and father, Clarence Pue. His sister Pamala lived in East Lake Meadows. He shot hoops with his friend Bo there. Had three other sisters and six brothers. His grandparents were Mr. and Mrs. Charlie Terrell, and Mrs. Sylvester Pue. 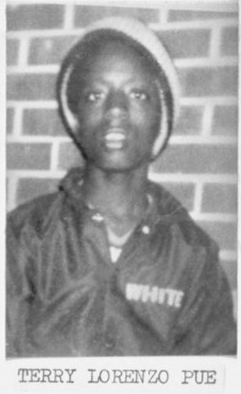 He attended the Challenge School at West Hunter St. Baptist Church and knew Lubie Geter and Lee Gooch. His brother Tony saw him board a bus on Hollywood Rd around 3pm Wednesday. Neighbor Clinton Sewell, 16, said that day Terry had asked him to play basketball with him, but Clinton declined because of the rain. So then Terry played by himself. Pue was last seen spending the night in a Krystal at 4976 Memorial Dr. SE, then trading bottles for money near a shopping center on Memorial. He spent the money he got from tricking the bottle redemption place, A&P, at the Krystal restaurant. Terry Pue's body was found off Sigman Road in Rockdale County by a passerby. This was where an anonymous man, on January 8th, called to tell police to find a boy's body. When police came up empty handed, the man called again, claiming he put another body there, just before Pue was found. Another call, believed to be from the same man, was traced to North Indian Creek Drive. A couple years later, a second skeletal body was found in this area. Dog hairs were found on the body. Abrasions were on his elbow and bruises were on his head. He was wearing a blue windbreaker with the name "Kim" in red lettering on the back, a denim jacket, a yellow T-shirt with a design of a palm tree, sunburst and "Puerto Rico" on the front and "Washington High" in blue on the back, beige colored knit slacks, dark blue colored socks and Hush-Puppy shoes. Surgical scars on his right knee helped identify the body. His cause of death was asphyxiation by ligature strangulation. Authorities considered this a "pattern case" in Williams' conviction.